Obama and Shaye: Will the White House Explain its Actions? Obama very little trouble, it would be close to sociopathic. Perhaps, instead, Obama really does have evidence suggesting that Shaye is allied with al-Qaeda? When considering the overarching question, the least appropriate option I think, is simply assuming the government has justifiable reasons for its actions. The Bush administration said Gitmo held the worst of the worst, it then proceeded to release the vast majority of detainees without ever charging them with a crime. The Obama has assumed the authority to kill even US citizens suspected of terrorism abroad without oversight from the other two branches of government. Institutions tend to do what they can get away with, a tendency that can become ever-more problematic when they can do so under cover of official secrecy. The response to the government declaring someone a terrorist should be, “prove it.” A sham trial by a US client regime propped up by US aid offered because of war on terror expediency doesn’t cut it. These are the key issues, all right. The question, given the legitimate sensitivity of intelligence sources, is whether the U.S. government is required to be entirely transparent about every single action it takes. In this case, President Obama expressed “concern” about the release of Shaye, which caused the Yemeni president to withdraw a pardon that was in the works. Should Obama be required to explain in detail the reasons he did this? I don’t know how to address this except to say that I think it’s a really hard question. Bright lines sound great from a distance, and there’s no question that bright lines are appropriate sometimes. They’re brightest in the case of direct U.S. action against a U.S. citizen. They’re a little less bright when it’s U.S. action against non-citizens. They’re less bright still when it’s a matter of nudging a client state to take action against a non-citizen. And it’s even less bright on a hot battlefield. 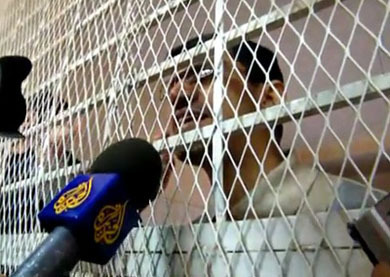 Human rights groups widely believe Shaye’s trial was a sham. But Shaye himself declined to offer a defense and his lawyer boycotted the trial. And the U.S. government isn’t talking. So there’s very little public evidence in either direction. Maybe Obama has information about Shaye’s connections to al-Qaeda that he can’t make public because it would endanger lives or compromise sources. Maybe he doesn’t. If he does, should he have to make it public regardless of the consequences? Or if he’s not willing to do that, forego any pressure on the Yemeni government? I don’t know. I think the line is pretty dim here. The plain fact is that when it comes to terrorism and the intelligence community, there are some cases where the public just isn’t going to be informed. That’s true of every country and every leader. So, like it or not, there are sometimes going to be cases where the question really does come down to whether you trust the president. That seems to be the case here. I’d like to see reporters press the White House further on this, but until someone digs up further information I’m not sure what the alternative is. 1Scahill’s Nation piece is largely concerned with Shaye’s reporting of an American attack on the village of al Majala, and that’s what I addressed in my post yesterday. Via Twitter, however, he made it clear that he thinks al Majala is just a small part of the story: “I personally believe the US wanted Shaye locked up because he was regularly interviewing AQAP people and Awlaki….I believe the US wanted Shaye to stop interviewing these people. That’s not a lawful reason to lock up journalists.” More here.